Additive manufacturing offers a wide range of fabrication methods. Stereolithography is a photopolymerization process to fabricate macroscopic objects (up to 1000 cm3) with a resolution of 10 to 100 μm in a few hours. In contrast, two-photon absorption gives access to resolution in the range of 100 nm but demands production times of up to several days for millimeter size component. We present a solution combining best of both worlds: In an innovative setup, the voluminous parts of an object are produced using stereolithography while fine structured parts are added using two-photon-absorption. In this way, macroscopic objects with nanoscale features are made accessible in reasonable production time. 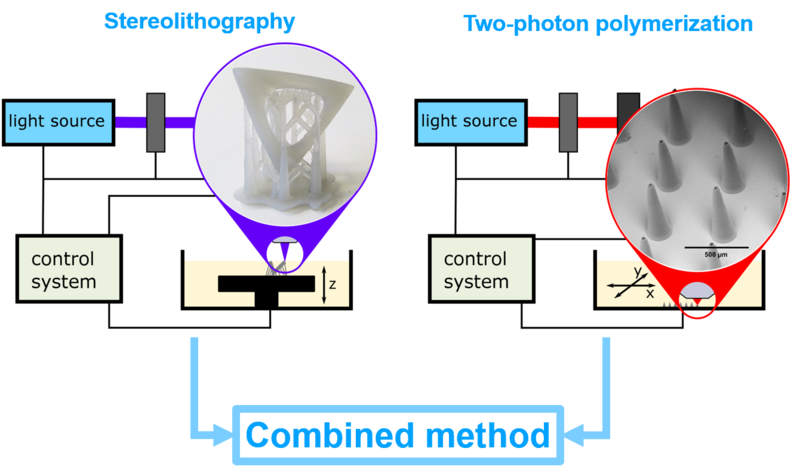 Figure: Macroscopic parts with nanoscale features are made available by combining stereolithography (left) and two-photon-absorption (right).